This webinar provides insight into how drive design decisions with simulation results by sharing findings from The State of Simulation Driven Design study. The idea of driving design decisions based on simulations was introduced some 15 years ago. Since that time, the concept has changed with new enabling roles, processes and technologies. The 2013 Simulation Driven Design study, conducted by Chad Jackson of Lifecycle Insights, captured a modern picture of this initiative by collecting the details of simulation efforts from over 1,000 survey respondents. It focuses on the use of simulation to make design decisions in the concept and detailed design phase, but not purely for verification and validation activities. 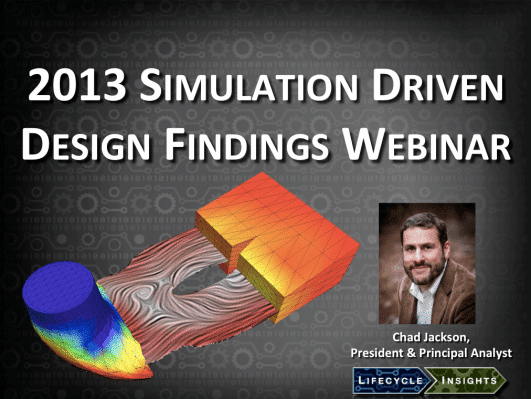 In this webinar, the findings that offer a modern picture of simulation driven design will be shared with commentary by the researcher, Chad Jackson of Lifecycle Insights.